A scene in the Pisgah National Forest. Jack Igelman/Carolina Public Press. Local government resolutions opposing expanded NC wilderness designations in the region’s national forests have started to stack up in recent months. What they will mean to the ongoing process of revising the region’s forest management plan remains unclear. On January 12, 2016, Bill Van Horn, speaking on behalf of 13 organizations, asked the Macon County Board of Commissioners to support a resolution to back the U.S. Forest Service’s recommendations for wilderness in the final draft of the Pisgah-Nantahala National Forest management plan. At the meeting, the commissioners took no action on Van Horn’s request. They instead reaffirmed a resolution passed nearly two years earlier, in June 2014, in which they opposed any additions to wilderness in the southwestern North Carolina county. Macon County was among the first of 12 counties and two towns that have passed non-binding anti-wilderness resolutions in an attempt to influence the current Nantahala-Pisgah National Forest Plan revision that will shape the management of more than 1 million acres of public land for the next several decades. Most of the resolution votes have been unanimous. Transylvania County commissioners approved the most recent resolution in March. “I don’t have any statistical data, but I’d say 95 percent of the county is opposed to wilderness,” said former Graham County economic development director Andy Cable who has been an outspoken critic of wilderness designation in the far western county. Cable resigned from his position in February. “I’m not sure it’s going to make a difference, but the resolution is the voice of our county to say we don’t want any more wilderness,” he told Carolina Public Press. Western Carolina University political scientist Chris Cooper said the county actions may, in fact, reflect a broader divide of how rural people across the nation see themselves. The text of the resolutions include a wide range of claims of how special land designations — primarily wilderness areas — would affect the uses of public land throughout the region, including: access to public land, road maintenance, search and rescue efforts, timber sales revenue and county tax receipts, wood milling, manufacturing, timber processing, habitat for native wildlife, fish health, forest age and health, and recreation, including hunting, fishing and mountain biking. Yet, what links them all is decisive wording that opposes additional designations, from Wild and Scenic River status to Wilderness Areas. “The word ‘wilderness’ has never sat easily with rural Western North Carolinians,” said Kathryn Newfont, a former history faculty at Mars Hill University who is now at the University of Kentucky and the author of Blue Ridge Commons: Environmental Activism and Forest History in Western North Carolina. For example, in 1978 wilderness advocates duked it out with logging and hunting interests in the wake of the Forest Service’s second Roadless Area Review and Evaluations (known as RARE II) wilderness designation initiative. The initiative called for more areas to be recommended for wilderness status. Still, Newfont said there’s been backing for wilderness designation among rural residents in the past, such as, support for the 23,473-acre Southern Nantahala Wilderness Area in Macon County which came about largely because local people wanted it protected. “When locals have seen wilderness as forwarding their concerns they’ve been willing to get on board with it and even have spearheaded it,” Newfont said. In the case of the Southern Nantahala Wilderness Area designated in 1984, locals saw wilderness as protecting generation-old commons from clear-cutting threats. However, opposition to wilderness has spiked when residents see outside interests trumping local interests. Rhetoric along these lines that was present in past wilderness debates and has surfaced again. Matt Wasson of Appalachian Voice in Boone has seen local backlash against wilderness before. In 2002, his organization began a campaign seeking permanent wilderness protection of two Wilderness Study Areas in the High Country, Lost Cove and Harpers Creek. Wasson said the effort met with coordinated defiance that led to an Avery County anti-wilderness resolution that cooled the campaign. That effort, Wasson said, was spearheaded by Steve Henson, who has also been involved with the current planning effort. Henson was a member of the Stakeholders Forum representing timber interests until he resigned in protest this winter. Avery County passed another anti-wilderness resolution on February 1, 2016. In addition to opposition to additional wilderness, the resolution also calls for the release of all wilderness study areas and roadless areas in the county. 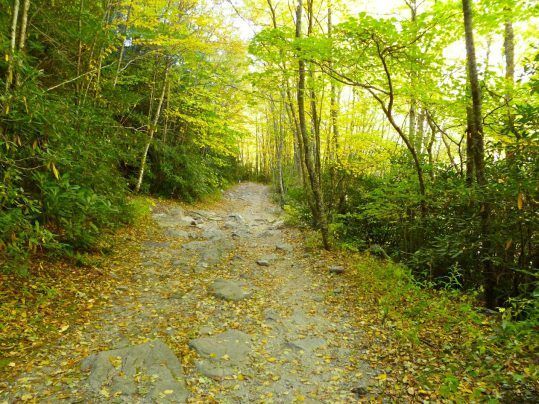 Matt McCombs, the District Ranger of Pisgah National Forest’s Appalachian Ranger District said the Forest Service have met with county officials across the region to help clear up concerns about a range of issues connected with wilderness designation that have appeared in the resolutions. Wasson, for his part, is understanding of the general anxiety associated with wilderness designation and the concern rural residents have with a sense of losing control of public land in their backyards. “As a general rule, in the environmental community too many things happen inside the beltway — whether it’s D.C., Raleigh or Atlanta — and too little in ways that engage local people and local government,” he said. Still Wasson and other wilderness backers are concerned that the extreme position taken by county commissions regarding land designation has negatively affected the public forest management process that began in November 2012. A final management decision is scheduled for 2017. Communication gap about NC wilderness? Brent Martin of the Wilderness Society has attended several of the county commission meetings, including the recent meeting in Macon County, and believes commissioners have been “misinformed at times and have had pressure” to pass resolutions. “(Rural counties) are feeling really beat up economically and see the National Forest as a liability rather than an asset,” Martin said. “It would be folly to ignore or discount any of the county resolutions,” Peters told CPP. He thinks the resolutions represent a wide segment of the public and that the county proclamations portray a dissatisfaction with how public lands are managed. While Andy Cable of Graham County said the resolution are a symbolic stand, he would have liked to have seen participation from county representative on the Stakeholders Forum – a collaborative structure funded by the Forest Service — which is nearing the end of its process. The forum did not include elected officials or county-level economic developers. Mark Shelley of the National Forest Foundation, the nonprofit organization overseeing the collaborative meetings, said members of the forum chose not to have political representation among its participants. “It just gets too complicated to have political representation,” said Shelley, including how to decide which counties to include at the table and who not to, for example, made inviting county governments too cumbersome. ”Folks on all sides are starting to see that there is a big, wide landscape out there to work with and that increasing the pace and scale of restoration and preserving some of the last wild places in the (Eastern United States) may not actually be mutually exclusive,” McCombs said. But finding common ground may be among the tougher questions with long-term implications for those in favor of wilderness and to those opposed. But exactly how forest planners protect land while honoring the local concerns has emerged as one of the trickier questions of the forest-planning process, as underscored by the county resolutions.